“The Hope,” a new venture from Mars Hill Productions, is an evangelistic media tool designed to communicate God’s redemptive story from Genesis through Revelation in just over an hour. While “The JESUS Film” has had tremendous impact throughout the world since its production in the 1970s, “The Hope” fills in the gaps by putting together pieces from God’s cosmic puzzle, letting us see where history has been and where we are now in God’s timeline. As ideas for “The Hope” were compiled, Mars Hill went to many of the ministries using “The JESUS Film” and asked them, “Do you see the need for a media tool in addition to ‘The JESUS Film,’ and if so, what should it look like?” Responses agreed that they wanted something that was 1) high in production quality—good enough for the most media sophisticated cultures, 2) was about an hour, 3) was sensitive to different cultures, and 4) told the whole story, creation through Christ. Hence, “The Hope”—a production that took us at Christian Spotlight by such surprise that we excitedly turned great time and attention into helping get this incredible message out to those who desire to see family, friends, and neighbors near and far come to know God’s entire story. 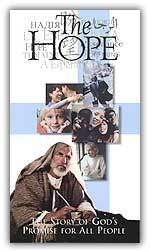 Armed with “The Hope” in DVD, video, Video CD, or via free online presentations, we expect that over time millions will come to know Christ personally. To learn more, read our review, or see our ministry resource page where you can order your very own copy.